More than 60 years later, the Federal Bureau of investigation (FBI) and the United States government do not officially admit that President Franklin Delano Roosevelt (FDR) traveled to Canada on a secret fishing trip during World War II. Local legend supports the story that FDR stayed on Birch Island in Georgian Bay twelve miles off Manitoulin Island the week of August 1-8, 1943, shortly before he attended the historical conference with Winston Churchill and other Allied leaders in Quebec. Finally, in 1999, divers raised the “smoking gun,” the remains of a four-seater biplane from Georgian Bay. The Beechcraft UC-43B Stagerwing floatplane sank in the Northern Channel off Manitoulin Island on Friday, August 6, 1943, while FDR fished and his secret service agents watched from his private railroad car parked on a Canadian Pacific railroad siding near the summer cottage of Joyce Standish’s family. At the time, Standish was in her early twenties and a third year English student at Queen’s University in Kingston, Ontario. She recalled that the presidential train stood about 500 feet from the shores of the Bay of Islands, part of Georgian Bay. Special tracks and a platform had been built at Birch Island station to accommodate the special train. From the trains windows FDR and his entourage could see a channel studded with islands and the La Cloche Mountains etching a scencie backdrop. Waters around Birch Island, Whitefish Channel, McGregor Bay, and the North Channel abounded in bass, pickerel, northern pike, muskellunge, and trout-important factors in FDR’s decision to schedule a fishing trip there. During FDR’s week-long visit, all of Manitoulin Island and the North Shore were considered a restricted area under wartime censorship. The Manitoulin Expositor, published at Little Current, said that the presidential train consisted of ten cars and arrived at the Birch Island Station on Sunday, August 1. Joyce Standish in her accounts wrote that while sitting in her boat in the bay she distinctly counted 14 railroad cars. The train (either 10 or 14 cars) stopped at a special platform built for the occasion. Cliff Bradley was the pilot on board the Wilmette, a Coast Guard cutter that also supplied boats for the party. The Manitoulin Expositor remarked that if the President came North yearning for cool nights, his wish had been granted because the temperature had fallen and local stores were being raided for a record sale of blankets. The Recorder of Gore Bay added more details. At the point where the presidential train sat on the siding at Birch Island, they bay practically touched the railroad embankment. Here carpenters constructed a wooden platform and a railed gateway that led down to a dock. Several jeeps and two high powered cars came by land, complete with squads of secret service men and Royal Canadian Mounted Police. Strict censorship shrouded news about FDR’s trip- his departure from Washington July 31, his trip to Niagara Falls and then to Sudbury through Ontario, with every railway crossing guarded and switches spiked to guard against accidents. Censorship shrouded his arrival at Birch Island on August 1, and finally, his departure the following weekend. You certainly know the fishing holes for these beauties. If I get a few more like this, maybe I’ll have one left when I get back to work to prove to the press boys that I really went on a fishing trip. They won’t believe me without the evidence. Communication headquarters will be set up near Birch Island Station, Ontario. The President an his party will live on the train. Arrangements have been made for twice-daily air-mail service; usual telephone and telegraphy connections with the White House will keep the President in close communication with Washington. "Every facility was provided to keep the President in touch with his most pressing affairs. The dynamo car was equipped with full transmitting and receiving radio equipment, which was put into service immediately on arrival at Birch Island. A telegraph operator was on duty during the time the train was at Birch Island, and the communications department had two additional first-class operators available at Sudbury on a minute notice if required. Arrangements had also been made to cut in telephone service if this were required." Joyce Standish also discussed the communications system with Fred Donegan, a close summer neighbor of hers, who also happened to be an official of the Canadian Pacific Railway. According to Fred Donegan, officials had set up a sophisticated communications system at the log cottage of the Nicholls family who lived next door to Joyce and her family. Three direct lines were open to the White House at any time and a wireless was set up to relay messages anywhere that FDR and his staff needed to contact. Canadian Army Signal Corps personnel were on hand in case of equipment breakdown or other emergencies. While FDR relaxed, fished, and geared up for the Quebec Conference, he also monitored the events of the Second World War that continued to engulf the globe. The week was eventful. On August 2, 1943, Lt. John F. Kennedy’s ship, PT109, was rammed and sunk by a Japanese destroyer in Blackett Straight in the Solomons. On August 3, 1943, Red Army forces broadened an offensive drive toward Kharkov in the northern Ukraine. From July 24 through August 2, 1943, the RAF and the U.S. Air Force conducted six raids on Hamburg, Germany, and its suburbs. The raids destroyed many industrial sites as well as homes, schools, and churches. On August 5, the Soviets captured Orel and Belgorod and nearly destroyed the German Second Panzer Army at Orel. On New Georgia, U.S. forces captured Munda’s airfield, ending six weeks of hard ground fighting and air combat. On August 6, Germany began to partially evacuate Berlin because of the destructive Allied air raids. German divisions started pouring into Italy to assume complete control of its defenses because Hitler feared that Italy would defeat to the Allies. August 6-7 saw four Japanese destroyers bringing troops and supplies to the Solomons intercepted by six U.S. destroyers in Vella Gulf. Three of the Japanese ships were sunk and the other one damaged. None of the American destroyers were hit. Joyce raced her small motorboat, the Leapin’ Lena, out to the smoking plane as it settled lower into the water with the other pilot standing on one of the plane’s pontoons. She urged him to jump, assuring him she would pick him up in the boat. He refused. Then a Navy cutter sped up filled with sailors and secret service agents. “Just turn back, Joyce. This is a matter for the U.S. Navy to handle,” the sailor on the bow said. A Sudbury Daily Star article reported that the plane engine burst into flames as it was being warmed up and the pilot and gunner aboard at the time escaped without injury. The canvas fabric of the plane’s exterior burned very quickly and the pilot and the co-pilot feared that the burning plane might start a forest fire. The Navy personnel hurriedly removed any presidential war correspondence and then used an axe to gash slits in the aluminum floats on the plane so it would sink. Swiftly, the plane sank in the bay. The Navy planned to salvage the plane, but Navy officials underestimated the depth of the water in the channel. They believed the depths to be much shallower and unsuccessfully tried to bring up the scuttled airplane. According to U.S. records, the plane sank in 90 feet of water in the Bay Islands area at the east end of the North Channel. Joyce Standish also noted that over the years several people approached a diving company about the possibility of raising the airplane, but it took over 30 years to locate the plane at the bottom of the bay and nearly 50 before it would be brought to the surface. In 1977, the local Aquanauts Diving Club, led by Little Current resident Richard Hammond, found the plane. Sudbury businessman Cliff Fielding, the grandfather of Jeff Wallace, who would play an important part in the float plane story in the 1990s, spearheaded the mission to recover the plane. After the diving team located the plane, they began making recovery plans, but gave up the operation when they couldn’t locate many of the plane’s parts. Richard Hammond also painstakingly researched the story of FDR’s presidential visit to Birch Island. He chronicled his investigation of President Roosevelt’s Mail Plane, nothing that the aircraft was a float equipped USAAF, Beechcraft “Staggerwing,” UC-43B “Traveler,” assigned to carry dispatches from the United States to Canada during FDR’s fishing trip at Birch Island, a very scenic and interesting part of the North Channel, Lake Huron, a few miles North of Manitoulin Island, in the first week of August 1943. He stated that he began researching the aircraft in 1969, and he and a group of divers located its remains on June 19, 1977. In his research, Hammond also uncovered the accident report which revealed that the plane was stationed at Selfridge Field, Michigan, with the 1st Air Force, 4th Base Headquarters and Air Base Squadron. First Lieutenant Edward Kopp was the pilot and Sergeant Charles J. Griffing was the crew chief. The plane was being flown out of Oscoda, Michigan, while assigned to President Roosevelt’s visit to Birch Island. It flew daily to and from Birch Island from Oscoda with general dispatches and often carried passengers. Lieutenant Kopp taxied the plane into Jumbo Bay to the take off point. He checked his instruments that according to him showed no signs of malfunction, but then the engine began to run “very rough and sputtered.” Lt. Kopp aborted the flight, turned around, and started taxiing back to the mooring area. About half way back to the mooring area, he said that smoke started coming out of the dash board. Immediately Lt. Kopp turned off the ignition and ordered his passengers to get off onto pontoons. He gave them life preservers and told them to strip to their skivvies so they would be ready to abandon the plane. He grabbed a fire extinguisher and tried to put out the fire, and then went back to the passengers and told them to abandon ship. He made sure his passengers were safely in the water before donning his own life preserver and attempting to extinguish the fire with water. When the cabin filled with smoke and the flames licked closer to the gas tanks, Lt. Kopp abandoned ship as well. He started swimming, but before he reached the shore the plane had burned completely. He estimated that it took the airplane about seven minutes to burn and sink at 3:00 p.m. in 22 fathoms of water. “Upon reaching shore, I ran to our location and directed the speed boats to pick up the two passengers,” Lt. Kopp reported. Hammond noted that in 1977, “I found the remains in 85 feet of water.” In his report, Hammond debunked some of the other myths surrounding the plane. He said that the rumor that the plane ferried plans and correspondence between Roosevelt and Churchill via Washington D.C. was totally inaccurate. A single airplane flying across mid-Lake Huron would not carry secret documents and plans for two world leaders during wartime. He contended that the plane was not armed with machine guns or bombs, although the crew carried side arms and there were small arms stored on the plane. Jeff remembered seeing the plaque on the rock on the left side of Highway 6 coming from Little Current commemorating President Roosevelt’s 1943 visit. He obtained permission to recover the plane from General Charles Metcalf, director of the U.S. Airforce Museum. General Metcalf told him that the U.S. military would not release the title, but would relinquish all rights to the plane. He also got approval and salvage rights from the Canadian Coast Guard. Along with professional divers from Tek Dive North of Sudbury and the help of Shark Marine, a marine technology company from Belleville, and others, Jeff Wallace searched anew for the plane. He relied heavily on the firsthand accounts from people who lived in the area at the time and on divers who had participated in the 1970s search. Gary Trimmer helped locate the plane and Sudbury divers David Marshal and Ray Prediger and Dan Brunne of Whitefish Falls, who were involved in the original search, also helped in the operation. Jeff Wallace called Ian Morley “one of the premier divers in the area and of this generation,” and signed Morley on as a recovery specialist for the project. Shark Marine’s side sonar first detected the location of the long floats as they lay on the smooth silt bottom of the North Channel. The canvas parts of the plane, steel alloy tubing and wood frame had deteriorated after 56 years in the water, but the radio, fuel tank, alternator, and ignition and other bits and pieces survived the decades of submersion. The team found the 450 horsepower radial engine and propeller about 600 feet away in 35 feet of water. Nearby, they located the plane’s nose cone. The Canadian Conversation Institute told the team how to clean plane parts in WD40 oil and dry out and stabilize them. After the salvage was completed, Jeff Wallace’s team concentrated on developing research histories for the Little Current-Howland Centennial Museum. He said that he had an enhanced appreciation for the tremendous history in the area and that he hoped the project and the accompanying multimedia display at the museum would allow the community to enjoy the political and economic benefits of the display. The aircraft is permanently installed at the Centennial Museum in Sheguiandah, Ontario. 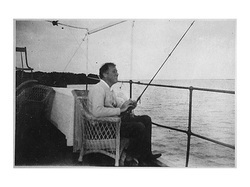 In 2002, Curator Linda Kelly has welcomed many American and Canadian visitors intrigued with the story of FDR’s secret fishing trip. Nearly 60 years later, FDR’s mystery fishing trip provides an exicting “how dun it” for history loving Great Lakes detectives! Franklin Delano Roosevelt Presidential Library, Hyde Park, New York. Letter to Anna Boetiger. Joyce Standish. Unpublished manuscript, A Visit from F.D.R. Copy at FDR Presidential Library, Hyde Park, New York.